NOTES: Additional bits from Pavla Firefly kit. 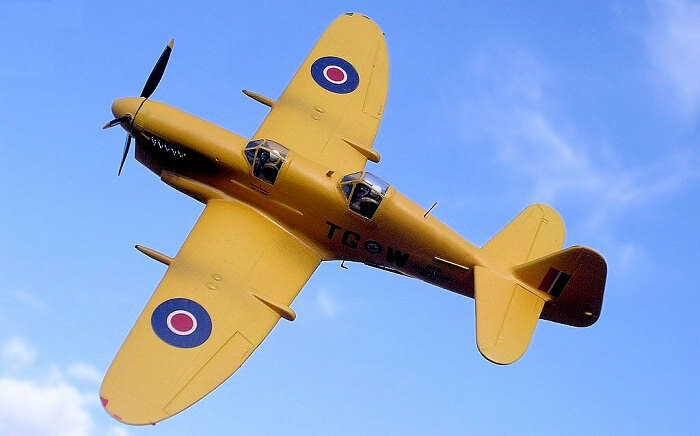 The Fairey Firefly was developed from the Fulmar, a WWII carrier borne fighter, and first flew in December 1941. By 1944 it was operating from HMS Indefatigable and HMS Implacable and first went into action against the German battleship Tirpitz in July same year. The Firefly made success in the Far East when armed with rockets it took part in attacks on Japanese oil refineries and were the first British aircraft to fly over Tokyo. It was powered by a 1,730hp Rolls Royce Griffon IIB that gave it a maximum speed of 316mph at 14,000 ft and had a service ceiling of 28,000ft. The Firefly carried an armament of four 20mm cannons and eight 60 lb rockets or two 1,000 lb bombs. In due course of time it was possible that obsolete Firefly Mk1 airframe provided the opportunity to produce several training versions of the former two seat fighter. Hence the T Mk 1 and the T Mk 2 were developed. This featured a new raised rear cockpit for the instructor. Another trainer version the T Mk3 retained the original rear canopy. The inaugural flight of the T Mk 1 was on 1st Septe mber1947 and 32 were to be built/modified from Mk I airframes. The T Mk 1 served as a pilot trainer with the armament removed, the T Mk 2 featured two wing mounted guns for weapon training. The two guns nearer to the wing root were retained whilst the outer guns were completely removed. Among the countries and Navy that operated the Firefly was that of Canada. The fighter came in strength with the Royal Canadian Navy on 1st June 1946 and retired nearly eight years later on 1st March 1954. Among the 64 machines of five different marks that were built included T Mk1 and T Mk 2 that served with the RCN. Canadian Fireflies operated off both HMS Warrior and HMS Magnificent and equipped four squadrons while the trainer version served in the Operational Training Unit of the Training Air Group. It is not within this scope to go into further detail of the Firefly in RCN but rather to concentrate more on the Trainer version of the type. 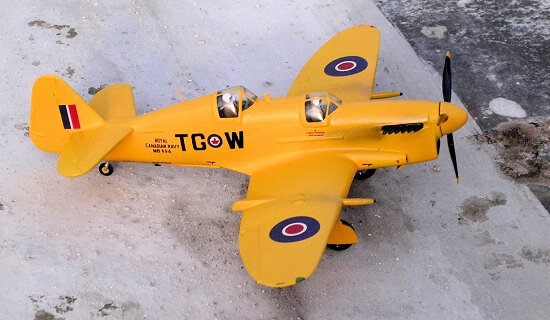 In fact the Canadian Navy operated two types of Firefly trainers: The T Mk 1 and the T Mk 2. The T Mk 1 being a two-seat dual control, unarmed, deck landing conversion trainer which differed from the F Mk 1 in having a rear cockpit for the instructor being raised by 12 inches above the normal position. This was to improve the vision by its occupant in landing. The T Mk 2 was the tactical weapons trainer having two 20mm cannons and a synchronised Gyro gun sight in each cockpit. The trainers were fitted with a VHF (TR5043, SCR522) radar and AN/APN-1 radio altimeter, and AN/ARR-2 homer and AN/ARL-5 radio range, and AN/APX-2 IFF. On 24th May 1948 four T1s were transported on Magnificent prior to departure for Canada for the first time. 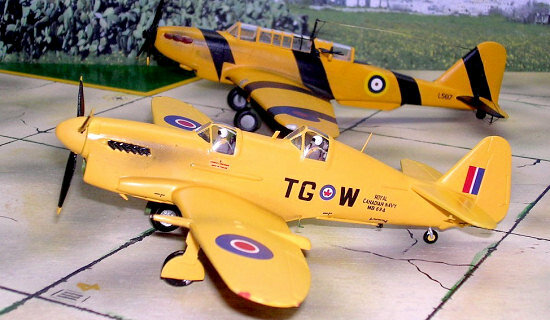 These were added to the RCN aircraft complement among other types as the Firefly Mk IV and Sea Fury. Of these four dual trainers two were sent at the end of March 1949 to Fairey Aviation of Canada at Shearwater for conversion to T Mk 2 and by the end of February 1950 both conversions were completed. From that point onwards until their retirement, complete overhaul and non-service repair work was conducted at Fairey Aviation. In the summer of 1947, aircrew and ground crew trainers destined to man the reactivated 826 Sq went to Britain to obtain elementary and service flying training from RAF in Tigermoth and Harvard respectively. Upon re-establishing military organisation in Canada arrangements were made with the RCAF to initially train pilots to wing standard after which they went to HMCS Shearwater for advanced training and to Britain for operational flying training which included day and instrument flying. 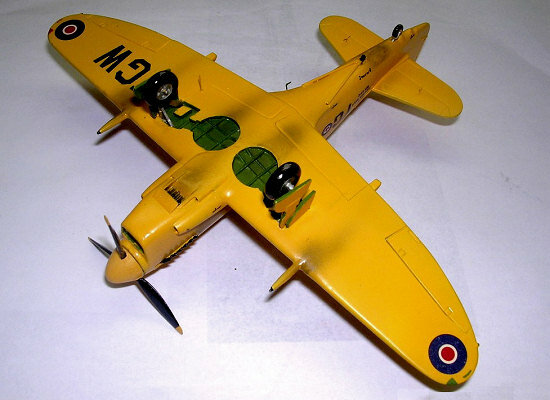 The Firefly T1s were painted trainer yellow overall and carried British C type roundels on aft fuselage and on both surfaces of the wings. C type fin flashes were displayed on both sides of the fin. They carried the ‘JG’ Training Air Group’s call sign letters to the left of fuselage roundel and the individual letters W, X, Y, and Z. The legend Royal Canadian Navy, along with the aircraft’s serial number, was painted on both sides of the rear fuselage, aft of the radio call sign. Blue style Maple leafs was applied to the red discs of the roundels on the fuselage and upper surface of the wings. 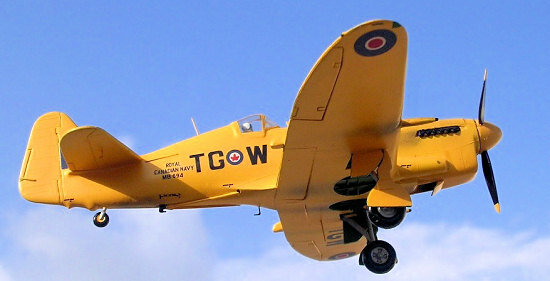 The T2s were also painted trainer yellow upon completion of conversion at the Fairey Aviation of Canada Ltd. The roundels appeared on the usual positions of the fuselage and upper wings, and C type fin flashes were carried on both sides of the fin. There are two ways that one can produce a Firefly T1/T2 trainer. 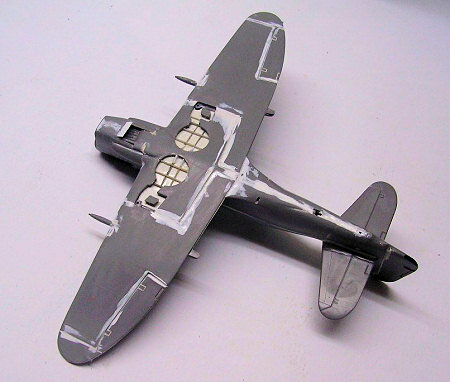 One can use the Pavla Models kit or one can carry out the cross conversion by merging the extra Pavla trainer items into the Frog model of the Firefly F Mk 1. Since I have used the Pavla kit to build the Target Tug version, I did not throw away the extra parts issued with the kit to produce the trainer version but utilised these to build the type by cross kitting with a Frog model. Only a little extra work and adjustment to the width of the Frog kit that was needed and the parts merged very well. Making use of the Pavla kit accessories provided two perfect clear canopies, one different from the other such that the rear canopy has a much more bulbous shape when compared with the front one. The Pavla kit also provides a surplus set of canopies in the event this will be needed. Interior cabin detail also is provided which included side fuselage streaks, instrument panels, seat, and control column, sufficient to make an accurate model of the Trainer. The raised cockpit with all the interior were first assembled according to the Pavla instructions having interiors as black instrument panel with white dials, leather seats with khaki straps. Interior walls painted grey green and side instruments in black. Crew figures carefully carved from the figures provided with the Frog kit which were also included to give scale effect or indication. These had Khaki flying suite and yellow Mae West with boots and gloves in dark brown. Seat straps were added separately made from strips of straw colour tape which secured the crew figure to the seat. The Frog kit fuselage halves were first assembled and when dry the rear top decking and the Pavla assembly kit part were brought together so that it was easy to mark with a gem marker the area on the Frog kit fuselage that needs to be removed w ith an exacto saw. This was then smoothened to produce a good joint. In fact it was noted that the Frog kit needed to widen the fuselage by 1mm in order to merge exactly the Pavla kit width. This was achieved by inserting a cross strut that fitted and widened the rear fuselage and by inserting small strips of plastic card by a measured amount so that on the outside there was a perfect matching smooth joint. In the event there is a slight mismatch a small evenly spread amount of putty will bring a smooth joint. The front pupil cockpit was also detailed in same way as the rear cockpit. The cockpit canopies are then cut with a pair of scissors and adjusted using a sharp pointed blade until in each case this is trimmed down to fit. The canopies were then put in place and secured with white glue. Detail to the wheel wells was added in form of cross brackets and thinned down wheel well doors. Four small air intakes at the lower sides of engine cowling were also drilled open. The engine cowling intake also needed careful reshaping with a sharp modelling knife. The two exterior guns were removed and the leading edge faired smooth with a smooth flat file. Careful study to photos of the T2 indicated the position of the antenna mast between the rear cockpit and tail fin, others that fit under the tail planes and a foot step added to port lower fuselage close to trailing edge under the fuselage. The exterior was first given an overall semi matt white base coat. A final coat was then applied to the complete kit (with the canopies masked) overall trainer yellow using standard Humbrol paint. The wheel wells painted zinc chromate and wheel oleo silver. Interior of intake painted dirty copper. Exhaust manifold and propeller were black with prop tips painted yellow. I used kit decals with modification to the kit serial number. Other wing and fuselage sides lettering came from my spares box. Some Firefly trainers also carried wing walkway in matt black located at the wing roots areas. I often was attracted by the different types of aircraft operated by the Canadian armed forces, possibly by the bright yellow trainer finish that makes the kit stands out. The T2 will find a place displayed alongside the Battle trainer and Battle target tug scale models. This was a simple conversion which contained all the parts almost ready to fit and is therefore much encouraged to anyone who wants to do a conversion for the first time. I am thankful to Robert Shoop of Colorado Springs who sent me sufficient relevant material literature to enable me to make the Firefly T2 in Canadian Navy markings.